O Hasina! Your Shameful Detention of the Female Dawah Carriers of Islam will only Strengthen the Call for the Khilafah! defunct secular system under which today no man, woman, or child feels safe, and which has failed to bring countless murderers and rapists to justice, yet it fills its prisons with innocent Muslims whose only crime is their obedience to Allah سبحانه وتعالى. O Hasina! If you think that imprisoning the dawah carriers of Islam will extend your oppressive secular rule, you are deluded! Your downfall Bi’ithnillah is inevitable and imminent. Indeed, arresting innocent Muslim women inorder to desperately cling to power only exposes further the weak, repressive nature of your regime and will hasten your demise Insha Allah. Furthermore, the campaign you are pursuing against this Deen and the sincere believers to please your Western imperial masters will come to no avail. You will soon witness it being crushed before your very eyes Bi’ithnillah with the imminent return of the Khilafah based upon the method of the Prophethood. Indeed, only a fool believes they can wage a war against Allah and be victorious!!! O Hasina! Do you think that detaining these devout Muslimahs will instil fear in the hearts of the female dawah carriers of Hizb ut-Tahrir and deter us from struggling to achieve our noble goal? No! Rather, it invigorates our determination to see the decline of dictators such as you and the birth of a state that will be a guardian to our needs and to our Deen. You may be able to shackle the hands of the dawah carriers but you cannot shackle the truth; it will rise and its carriers will multiply regardless of the feeble tactics you employ to silence it. We will counter your tyranny with even greater efforts and louder voices for the establishment of the Khilafah upon the method of the Prophethood under which those rulers and regimes who brutalised this Ummah and attacked this Deen will taste the severe consequences for their crimes. So we demand that you release our sisters immediately as well as all the innocent Muslims held in your dungeons and consider the humiliation of what happened to criminals like yourself in this life and the painful punishment that awaits them in the Akhira. 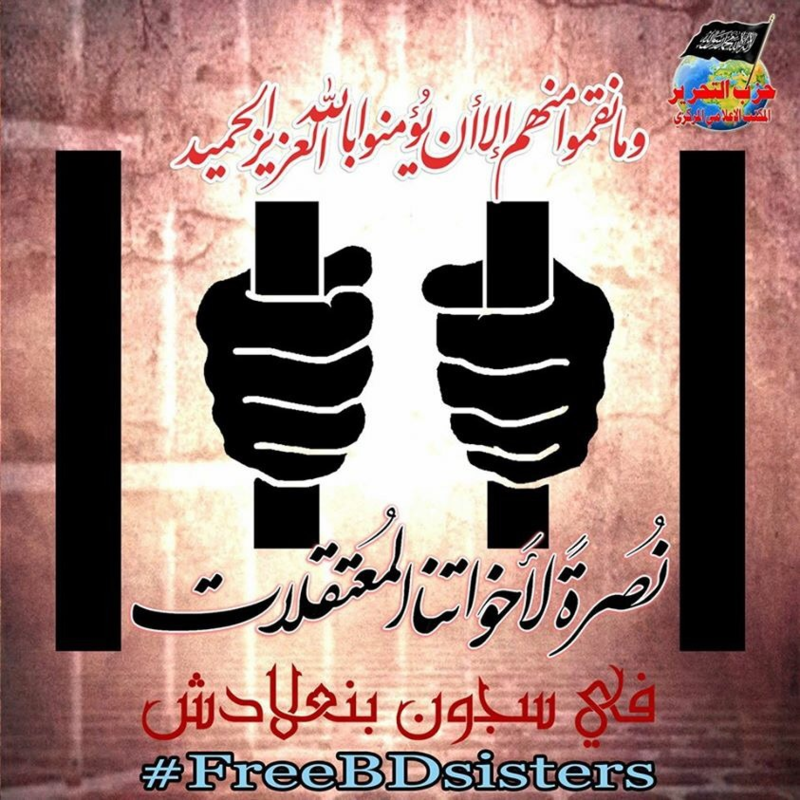 May Allah strengthen the hearts and grant sabr, ajar and protection to our dear brave sisters and all the courageous dawah carriers incarcerated in prisons across the world, and relieve them of their agony and take revenge on those who oppress them and return them to their families soon. Ameen. And we say to all those who dare to oppress the sincere believers, take heed, the end of your rule is fast approaching!!! اے حسینہ! تمہار ااسلام کی داعی خواتین کو شرمناک طریقے سے گرفتار کرنا محض خلافت کی دعوت کو مضبوط کرے گا! "وہ وقت قریب ہے جب یہ مجرم اپنی مکاریو ں کی پاداش میں الله کے ہاں ذلت اور سخت عذاب میں مبتلا ہوں گے"
اللہ ہماری ان عزیز اور بہادر بہنوں سمیت دنیا بھر کی جیلوں میں قید نڈر داعیانِ دین کے دلوں کو مضبوط کرے، انہیں صبرو اجرِعظیم عطا کرے اور ان کی حفاظت کرے۔ انہیں اس ظلم سے نجات دلائے اوران پر ظلم کرنے والوں سے بدلہ لے۔انہیں ان کے خاندانوں میں جلد واپس لائے، آمین۔اور ہم مخلص مومنوں پر ظلم ڈھانے کی جرات کرنے والے سب مجرموں سے یہ کہتے ہیں کہ خبردار ہو جاؤ، تمہارے اقتدار کا خاتمہ تیزی سے قریب آ رہا ہے!!!
" بے شک جو لوگ الله اورا سکے رسول کی مخالفت کرتے ہیں یہی لوگ ذلیلوں میں ہیں، الله نے لکھ دیا ہے کہ میں اور میرے رسولؐ ہی غالب رہیں گے بے شک الله زور آور زبردست ہے"